Set in an early 19th-century antebellum mansion and surrounded by 26 acres of manicured gardens, the Monmouth Historic Inn & Gardens is a luxurious bed and breakfast Inn that promises a traditional Southern retreat. 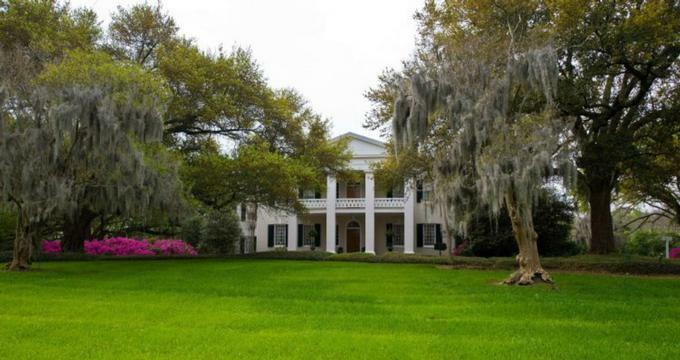 Situated in the heart of Natchez, Mississippi, the National Historic Landmark property offers exquisite accommodations in the form of deluxe guest rooms and suites, award-winning cuisine, magnificently manicured and maintained gardens, and gracious hospitality as only Southerners can provide. Exuding an ambiance reminiscent of a bygone age, lodgings boast period furnishings and antebellum-era reproductions, private bathrooms with showers and spa tubs, and ornate fireplaces. Elegant lounges and living spaces in the main house offer quiet spots to relax with a coffee or cocktail, and the meticulously nurtured gardens are ideal for a tranquil stroll. Other upscale amenities on and around the property include a renowned restaurant and lounge, a nearby fitness center and activities such as birdwatching, croquet, and fishing. The Monmouth Historic Inn & Gardens features 30 elegantly appointed and beautifully decorated guest rooms and suites located in the mansion and several outbuildings around the gardens, including the Quitman’s Retreat, the Carriage House, Garden Cottages, and the secluded Pond Cottage. All accommodations boast spectacular views of the gardens and feature plush queen or king-size pillow-top beds in designer linens and hypoallergenic pillows, and en-suite bathrooms with large walk-in showers, deep soaking or spa tubs, thick towels and fluffy bathrobes, and Gilchrist & Soames bath products. Some rooms and suites have operating fireplaces during the winter months and all feature exquisite period furnishings and antebellum-era antiques. In-room conveniences in every room and suite include flat-screen televisions with cable channels, clock radios, hairdryers, irons and ironing boards, bottled water and ice, complimentary wireless Internet and a nightly turn-down service. Accommodations are available in Deluxe Rooms, Antebellum Rooms, Deluxe Suites, and Superior Suites. Deluxe Rooms are located throughout the grounds and gardens in various buildings such as the Courtyard Building, the Garden Cottages, Pond Cottage and Quitman’s Retreat, while three Superior Suites are located on the second floor of the Main House. The Deluxe Suites are found near Monmouth’s walking trail and the ideally situated for exploring the historic property, including the private 19th-century cemetery of the first owner's family. The period Antebellum Rooms are housed on the second floor of the 1818 Main House proper above the Restaurant 1818 and the Quitman Lounge and Study. Set in what were once the original men’s and ladies’ parlors of the main house, the on-site Restaurant 1818 features authentic period crystal gasoliers and wall sconces and ornate antebellum-era décor. The elegant eatery serves an a la carte menu of gourmet appetizers, soups, salads, entrées, and desserts, accompanied by an outstanding selection of wines by the glass and bottle. Private dining by candlelight is also available for up to 12 guests at the main dining room table. A complimentary Southern-style breakfast is served in the Garden Room every morning and includes freshly brewed coffee, tea and other hot beverages, fruit juices, fresh fruit platters, yogurt, cereals, hot entrées and signature dishes, eggs, and freshly baked bread, muffins, scones and more. Deluxe amenities and guest services at the Monmouth Historic Inn & Gardens include a fully equipped business center with printing, copying and faxing services, a guest laundry, porter services and modern meeting spaces. A complimentary Southern-style breakfast is served in the Garden Room every morning; complimentary hors-d'oeuvres are available in the Quitman Study in the evenings, and the on-site Restaurant 1818 serves a traditional Southern-style dinner. Guests have complimentary access to a nearby fitness center and can enjoy historical tours of the mansion and the grounds, and in-room massages available upon request. Activities include croquet and fishing, with equipment provided, as well as bird-watching, antique shopping and golf nearby. Guests can also enjoy carriage rides through historic downtown Natchez, and picnics on the banks of the Mississippi River, which is minutes away. The Monmouth Historic Inn & Gardens is a beautiful location for romantic weddings, ceremonies, receptions and other celebrations, with a variety of stunning venues and exclusive guest services. Sites range from the wisteria covered pergola for intimate ceremonies and the Palladian Temple-styled Sanctuary to the secluded courtyard or the lavish main-house parlor for receptions. The Inn has a team of professional staff on hand to host a variety of events from engagement parties, baby showers, and rehearsal dinners to intimate and grand-scale weddings.